Break proof in nature, this Wooden Ply Box is ideal for packaging and exporting items like fruits. 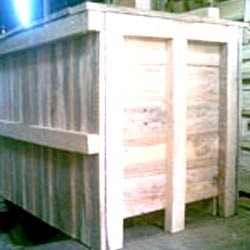 We are widely known in the market for offering high quality Plywood Box. These boxes are best in working and safe from termite and water. Durable in nature, these plywood boxes are quality approved by the professionals in line to meet appreciation by commercial patrons. Additionally, these boxes are extreme hard in nature. We hold immense expertise in exporting an extensive array of plywood boxes and pallets, manufactured using quality wood. Appreciated for their durability, these boxes can be purchased in variety of thickness.